“SOI” IS A THAI WORD FOR SIDE STREETS OR ALLEY WAYS WHICH, TOGETHER, FORM THE ESSENTIAL LIFE LINE THAT MAKES UP THE FABRIC OF BANGKOK CITY. 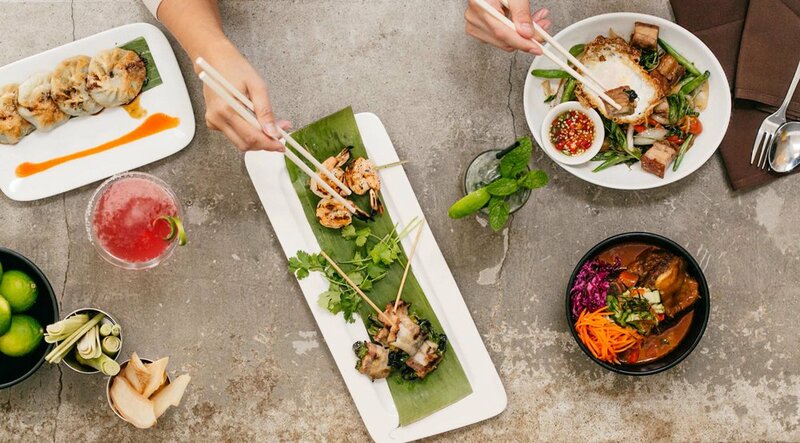 Like the city, our menu is a modern take on the traditional through the use of fresh local ingredients, sustainable practice, and creative approach to authentic Thai dishes. Fresh roll of vermicelli, prawns, and vegetables. Pan-fried dumplings of shrimp and pork served with Thai ginger soy. Green papaya, string beans, cherry tomatoes, & nuts tossed in sweet garlic lime dressing. Grapefruit salad with mint, cilantro, shallots, cashew nuts, and roasted coconut. Salad of crisped rice and Lao sausage, mixed herbs, and lettuce leaf wrap. Salad of minced chicken, nuts, roasted rice, dried chili flakes, and fresh herbs. Grilled eggplant with minced chicken & prawns topped with lime-coconut cream. Grilled skirt steak salad with fresh herbs, roasted rice, chili, and fresh lime juice. Wild caught Monterey squid salad dressed with lemongrass, chili, and fresh lime juice. Green mango salad with crisped catfish floss, lettuce, mint, shallots, & cashew nuts. Crisped pork belly stir-fried with basil, green beans, peppers, garlic, and chlli. Grilled salmon with asparagus & cauliflower in spiced ‘choo chee’ curry. Stir-fried eggplant, portobello mushrooms, scallions, peppers, & tofu in garlic-chili sauce. Stir-fried blue lake green beans and tofu in red curry ginger sauce. Star anise braised tofu, shitake mushrooms, daikon, baby bok choy, & glass noodles clay pot. Silken tofu, snap peas, eggplant, squash, pumpkin, & jalepeno with red tamarind curry. Charcoal grilled assorted vegetables & potatoes in mild yellow curry. WE BELIEVE OUR FOOD IS BEST ENJOY FRESH OFF OUR STOVES. IF YOU ARE ENJOYING OUR FOOD IN OUR DINING ROOM WE ARE HAPPY TO ACCOMMODATE ANY CHANGE TO MAKE SURE YOU HAVE THE BEST DINING EXPERIENCE. WE REGRET FOR TAKE-OUT ORDERS THAT WE CAN NOT MAKE ANY CHANGES OR OFFER REFUNDS ONCE FOOD LEAVES OUR RESTAURANT. Poached chicken breast & garlic rice served with cucumber, cilantro, and ginger-chili sweet soy. Sliced chicken stir-fried with oyster mushrooms, water chestnuts, scallions, and cashews. Crispy sliced chicken & string beans wok-fried with sweet kaffir 'pik-khing' chili. Grilled eggplant stuffed with chicken & cabbage served with fresh green curry sauce. Sauteed tiger prawns, eggplant, & ground nuts in basil, chili, wine sauce. Grilled salmon fillet with asparagus & cauliflower in spiced ‘choo chee’ curry. Group Dining is available for parties of 6 or more. 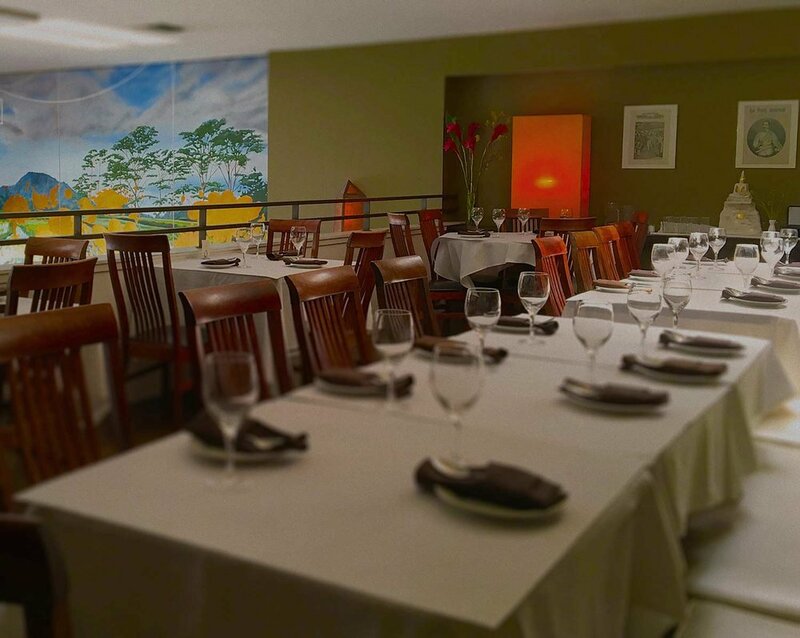 Our private mezzanine can accommodate up to 33 guests. The set up can be for a full course sit down dinner to hors d’oeuvres with cocktails. Call (510) 655–0889 from 11:30am – 10pm daily, or book online with OpenTable. Soi 4 offers personalized catering for all social occasions and corporate functions. We will collaborate with you to create an enjoyable menu of authentic Thai dishes. Contact us about your next event.